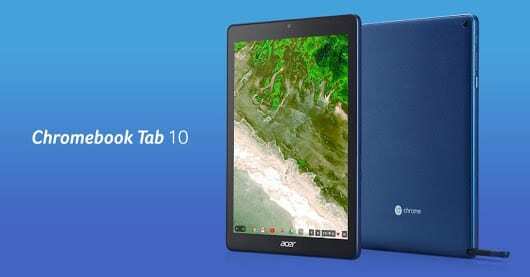 The Acer Chromebook Tab 10 has been launched as the first tablet running on Chrome OS. According to Acer, that tablet was created for educational purposes and perfect for students and teachers. Housing an impressive 9000mAh battery and lasting for up to 9 hours on heavy usage. The 9.7-inch tablet is pretty powerful on the inside as well, boasting of 4GB RAM, Rockchip RK3399 chip and Hexa-core processor. Want to know more? Stay with me. 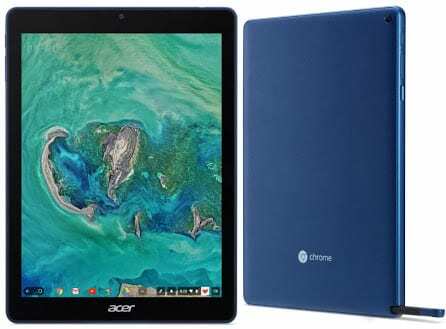 What is Acer Chromebook Tab 10 Price and Availability Status? Acer don’t usually pay much attention to the body of their devices obviously. The Chromebook Tab 10 sports a Plastic back that’s not so attractive. Nonetheless, the tablet has a smooth body that should offer a perfect grip. The only visible feature at the rear is the camera, which is at the top right corner fromva user’s view. The device is quite bulky by the sides, measuring 9.98 mm in thickness and weighing 549 grams. It’s only available in Blue colors at the moment. The company isn’t cut up with the bezel-less trend for their tablet just yet, it ships with lots of bezels with no physical or navigation buttons in sight. Just the selfie camera which is at the top bezel and the Acer logo at the bottom bezel. The massive 9.7-inch QXGA IPS LCD capacitive touchscreen is perfect for students, teachers and watching movies as well. With a resolution of 2048 x 1536 pixels and 264 pixel per inch density dishing out brilliant visuals. It supports 10-point multi-touch technology and stretches up to 71% screen to body ratio. Running the race here is the Rockchip RK3399 chip with Hexa-core processor and 64-bit CPU architecture. The 6-cores of processor boasts a clock speed of 1.5GHz with 28nm process technology as well. Controlling graphics is the ARM Mali-T860 MP4 graphics processor with 4-cores. For smooth multitasking and fast app launching, there’s 4GB RAM space available with a memory speed of 1.866GHz. Furthermore, 32GB internal storage space is available as well and upgradeable up to 128GB using a memory card. 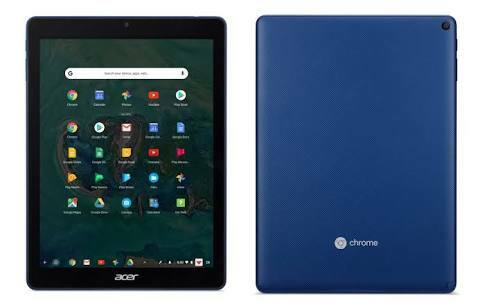 The Acer Chromebook Tab 10 is the first tablet running on Chrome OS. At the rear, the 5MP shooter has f/2.2 aperture and captures 2K resolution images as well. The Chromebook can capture photographs with 2592 x 1944 pixels in dimension, coming with a LED flash and other features to help out as well. HD recording of 720 pixels at 30 frames per second, while the 2MP selfie camera is perfect for video calls. Powering the Acer Chromebook Tab 10 is a 9000mAh (34Wh) non-removable Li-Po battery with fast charging technology. With the fast charging feature, it shouldn’t take up to 3 hours to fully charge up the battery from 0% to 100%. The Acer Chromebook Tab 10 is available on Shopping stores starting from $249 (N70,000) to $349 (N110,000). Click on the links above to view the latest Acer Chromebook Tab 10 price & availability. This device is cheap and profitable. Nice specs with good quelity battery. I’m looking forward to Samsung or ASUS making Chrome OS tablets. They already make the best Android tablets on the market, for whatever that’s worth. Happy Easter to you all @ TecHLecToR.com ! May the Power of Resurrection fill your mortal life with spiritual vitality & eternal joy. May your home be blessed richly in Christ Jesus. May all your failures turn to outstanding success. Your persistence impossibly shall turn to instant miraculous possibilities. You’re healed from all your infirmities & diseases. By the anointing of God you’re disconnected from carnality & divinely connected to Yahweh Elohim. Your life shall be peaceful, prosperous, victorious & full of godly testimonies. You shall not labour in vain, your labor shall be greatly rewarded. No man will steal your joy & your glory shall not be wasted nor devoured. Enjoy the Resurrection season daily. I love you with the love of Christ Jesus. You’re blessed.